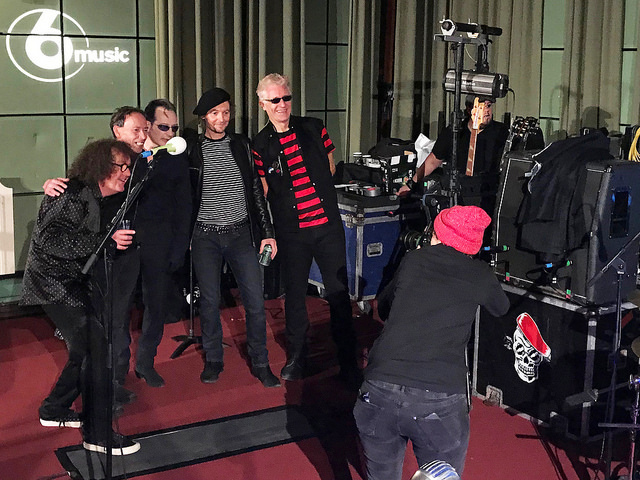 BBC RADIO 6 MUSIC – Steve Lamacq, Christmas Punk Party – Friday 8th December 2017. BBC Maida Vale Studios. Having held a Ska party last year BBC Radio 6 Music DJ Steve Lamacq decided to punk it up this Christmas. 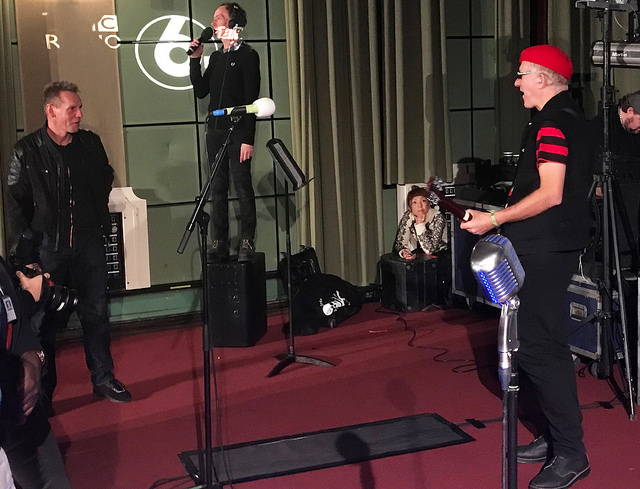 Booking punk stalwarts The Damned and the re-energised Ruts DC to play at the BBC’s Maida Vale studios proved to be a tempting proposition with 3000 fans applying for tickets. I got lucky and joined the relatively small crowd to witness a very intimate gig with two bands used to playing much larger venues. Before everything started though Steve Lamacq interviewed his guests – Dave Ruffy and Segs of The Ruts DC talking about the early multi cultural days of the Ruts, Stuart Pearce (yes, that’s the Euro 96 and England U21’s manager Stuart Pearce) explaining his life long obsession with punk and, of course, Captain Sensible of The Damned. The whole thing is worth a listen – especially Pearce’s tales of checking the match fixtures and then working out what gigs were on in the local area. Somewhere in between all this was Brix Smith playing some great punk records and a set each from Ruts DC and The Damned. With around 25 minutes to play with before the News came crashing in Ruts DC played a blinder. Kicking off with more recent output including ‘Kill The Pain’ from their great last album ‘Music Must Destroy’ they ended with a slew of classics. ‘In a Rut’, ‘Babylon’s Burning’, ‘Staring At The Rude Boys’ all sounded fresh and vital before they ended bang on time with an absolutely storming version of ‘Psychic Attack’. The Damned had a lengthier alot – around 40 minutes during which they stuck to their best known numbers – and a new one. ‘Standing On The Edge Of Tomorrow’ is a classic Damned cut. 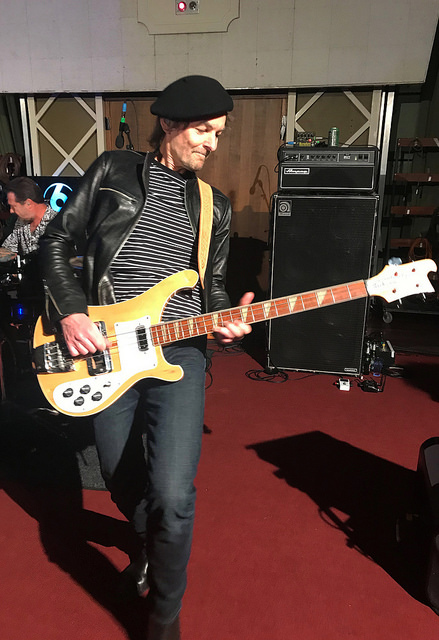 Maybe it’s the reintroduction of Paul Gray and that Rickenbacker bass sound but this new song slotted seamlessly into the set depute singer Dave Vanian claiming they had only had one rehearsal. Once ‘off air’ the band treated the audience to two more songs – “There Ain’t No Sanity Clause’ and ‘Smash It Up’. Watching them at such close quarters was a real treat – Vanian’s little inflections to his voice more apparent and Sensible as ever larking around but delivering the goods in perfect fashion. A special mention must go to Steve Lamacq who took the time to address the crowd to explain that if it wasn’t for punk he wouldn’t be doing the job he loves. He spoke of his childhood in a town where he had three peers, two of whom didn’t like him and three of whom he didn’t particularly like either. Like many other people punk gave him a way to change his social situation and move on to a life that he could feel comfortable with. I’m not sure if that’s in the online broadcast but it really should be. 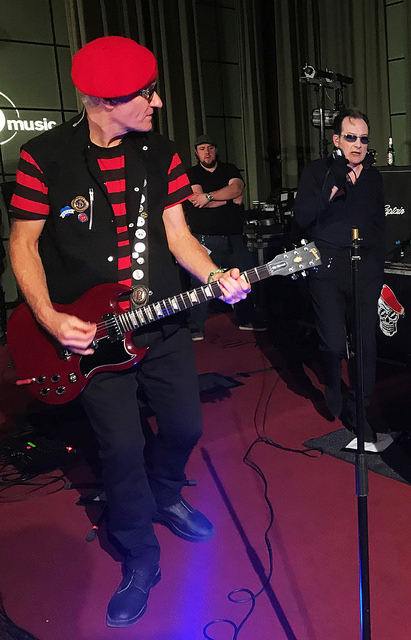 Steve Lamacq with The Damned but where’s Pinch? Paul Gray returned to the Damned after an over 35 year absence. The rather odd sight of Stuart Pearce, Steve Lamacq on a box addressing the crowd and Captain Sensible.